There’s already an Academy Award nominated movie that chronicles the rise of Mark Zuckerberg and the social media outlet that he helped create. But we had to wait to for a comic book to set the story straight. Bluewater Productions promises that its just-released biographical comic book, “Mark Zuckerberg: Creator of Facebook,” is a “more balanced portrayal of Zuckerberg” than we saw in last year’s film The Social Network. Freelance journalist Jerome Maida wrote the story and Sal Field penned the illustrations. 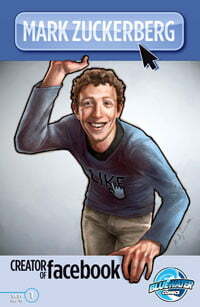 Anyone who has seen The Social Network knows that the film is less than gracious when it comes to retelling Zuckerberg’s Facebook business dealings — especially early on when the site was known as “The Facebook.” Maida says that, while the comic avoids making Zuckerberg out to be a villian, his portrayal doesn’t shy away from showing Zuckerberg warts and all. The comic book is available today in comic book shops for $6.99.